France won this game in the first half, but no one told Iceland, who went on to “win” the second half in a fitting finish to their historic run. For the fifth straight game, Iceland were unchanged. It’s difficult to criticize given their limited depth, but fatigue probably played a factor in the game. After a very solid tournament, Kári Árnason was at fault in three of the first half goals, looking a step slower and unable to deal with Olivier Giroud on the ground, in the air, or when passing in behind. In fairness, Giroud’s second half header was scored over Árnason’s replacement, Sverrir Ingi Ingason, so it’s not clear that a different line-up would have changed much. A more legitimate criticism might be aimed at the high defensive line with which Iceland opened the game. Some pundits have pointed to comments by co-manager Heimir Hallgrímsson and captain Aron Gunnarsson that Iceland hadn’t played their best football yet as signs of a hubristic attacking intent against France. But Michael Cox had noted even in Iceland’s victory against England their surprisingly high defensive line at the start of the game. It was the resulting space behind that left Árnason so painfully at Giroud’s mercy. On the other hand, that high line also helped create Gylfi Sigurdsson’s wonderful 3′ attempt and Gudmundsson’s half-chance at 5′. At any rate, you can’t blame Iceland for not taking the game to France. 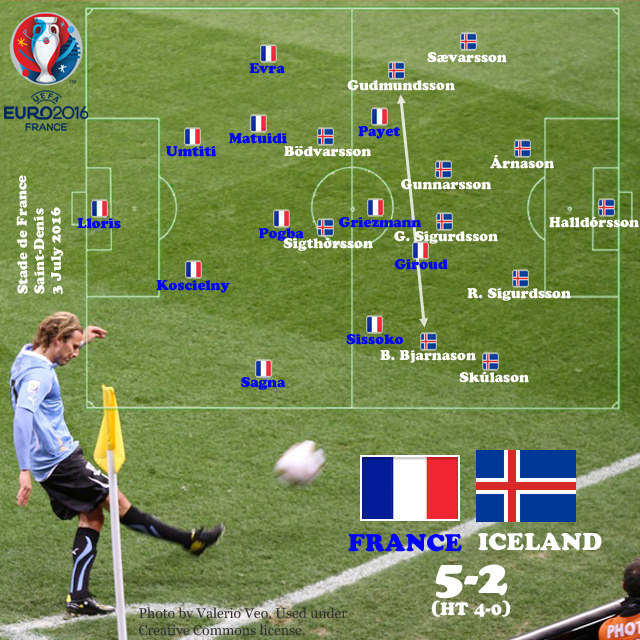 Though the game was really over by then, Iceland started the second half with two legitimate tactical substitutions, scored goals early and late, and brought on aging legend Eider Gudjohnsen for the final 10′ of the game. It was a dignified end to a magnificent run. With suspensions to center-back Adil Rami and midfielder N’Golo Kanté, Didier Deschamps to brought in Samuel Umtiti and Moussa Sissoko, opting for a 4-2-3-1 with Sissoko on the right. The latter of these changes is the more interesting tactically. With the exception of two injury-time substitutions, Sissoko’s only appearance in the tournament had been in the B-squad dead rubber against Switzerland in the final group game. 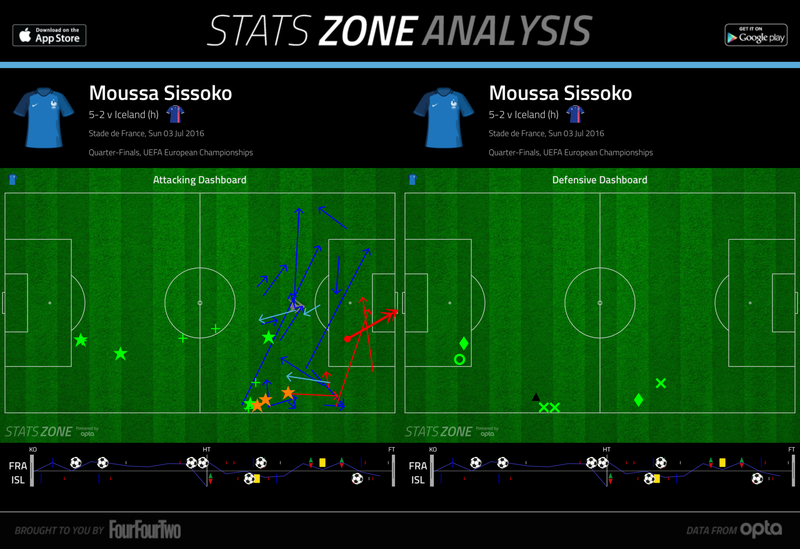 There, Sissoko had played on the right of the midfield triangle rather than as a winger. Deschamps had many options other than Sissoko in a 4-2-3-1. He might have used Kingsley Coman in that role, or put Anthony Martial on the left with Dmitri Payet central and Antoine Griezmann right. He could even have chosen to remain in a 4-3-3 with Yohan Cabaye replacing Kanté in the deep-lying role. Michael Cox has suggested that against Iceland, Deschamps probably felt no need for a true holding midfielder (skip down to “France System”), an interesting idea that frames the shift from 4-3-3 to 4-2-3-1 as an attacking rather than a defensive adjustment. That still doesn’t explain the choice of Sissoko as the additional attacker, however, especially since he is better known for his work rate than his end product. It’s possible that Coman wasn’t fully fit, as he came off with an ankle knock at the end of the last game. But if so, his appearance late in the game, with nothing at stake, is odd. Another possibility is that Deschamps wanted to try a more defensive winger in advance of the Germany semifinal, which would imply a place for Sissoko in that game. Whatever the reasoning, Sissoko’s game will have created a selection problem for Deschamps. He looked looked sharp early on, and though less noticeable as the game wore on, his final stats were impressive. He created three chances and led the team in both take-ons (4/7) and final third passing (18/20). Defensively, he contributed 5 ball recoveries, 3 tackles, and 2 interceptions. This is solid production in France’s best performance of the tournament. Leaving Sissoko in the line-up, though, would mean sacrificing either Kante, Blaise Matuidi, or one of France’s offensive stars. None of these would be popular choices, and leaving Kante out would further be counter-productive from a defensive standpoint. Given Pogba’s strong performance, I would guess that Kante will replace Matuidi, probably in this 4-2-3-1. Despite Umtiti’s perfect passing record (76/76), it seems likely that the more physically-imposing Rami will return to the line-up. Although France would appear to be peaking at the right time, they have yet to face serious opposition. On the other hand, they have avoided the selection problems facing Germany, who will be without several key players (Mats Hummels, Sami Khedira, Mario Götze, and quite likely Bastian Schweinsteiger). Rightly or wrongly, most viewers will see the winner of Germany – France as the presumptive European champions.